Dothistroma needle blight is more commonly known as red tip or red band disease. To the best of my knowledge it first appeared in the radiata pine forests around Cooma NSW and is rumoured to have been introduced to Australia from New Zealand on forestry workers’ equipment used in this area. I first came into contact with this disease some time ago, during the visit of Walter Pall to Canberra. At the AABC Conference there, I displayed a pine tree. Close by was a beautiful pine from the Adelong region in NSW. Sadly, I brought home to the South Coast red tip disease despite spraying my tree before showing it. I also noticed evidence of it on pines in a well known bonsai nursery in Sydney. 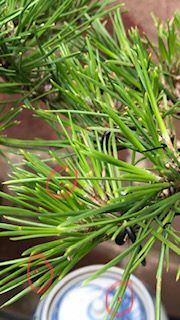 You will notice red bands or red tips on your pine needles if you have this disease. The spores are usually spread by rain or are wind-blown or splashed. (See circled areas in photo). Treatment is with a copper spray- copper oxychloride. The copper spray Kocide Blue is best but more expensive. It is very fine [powdered] and provides better coverage. Wooly pine aphid is also another common problem with pine bonsai. It is seen at the base of the needles, appearing as a small woolly mass. Treatment is with the spray Malathion.